To the builder, energy efficient homes mean greater profitability. Energy features usually add less than 1% to 2% to construction costs, but greatly increase the marketability of a home. According to a survey conducted by the National Association of Home Builders, energy features are a major consideration of today's home buyer. Most energy features do not require special skills or materials, nor do they increase construction time. Many features also increase the durability of the home, which means fewer call backs and reduced liability for the builder. Energy efficient homes save homeowners money and are more comfortable, factors that lead to satisfied customers and great referrals! In addition, builders of energy efficient homes have a product with greater marketing appeal. A national survey conducted by the Realtors National Marketing Institute showed that potential home buyers ask more questions about the cost of maintaining a home than anything else. The most frequently asked questions relate to utility costs, insulation levels, and the home's general energy efficiency. With the increased marketability of an energy efficient home, builders can expect a quicker turnover. This was further demonstrated by a homeowner survey that indicated 94% of new home buyers believed energy features were important in their home-buying decision. The same survey found that energy features, (i.e.insulation, improved windows) ranked in importance above such popular features as wall-to-wall carpeting, dishwashers, and fireplaces. Another builder benefit is the fact that energy efficient homes are worth more. The Realtor's National Market Institute survey also showed that 78% of the real estate appraisers felt that energy efficient homes were worth more -- approximately 5% more. 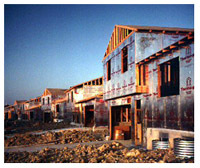 Although constructing an efficient home does mean higher costs to the builder, these costs are either offset by material and equipment savings such as 2"x6" wall stud construction (which uses less lumber as a result of spacing studs 24" on center) and smaller equipment sizes, or increased selling prices and quicker turnover.